In a past blog post, I discussed the short and long term effects of noise exposure on employee hearing, which is one of the most pervasive health and safety concerns for American workers. Exposure to loud noise kills the nerve endings in the inner ear, so regular exposure results in a greater number of dead nerve endings, ultimately leading to permanent hearing loss that cannot be corrected by surgery or medicine. Short term exposures can also cause a temporary change in hearing or a ringing in the ears (called tinnitus), and repeated exposures can cause permanent tinnitus or hearing loss. This hearing loss limits one’s ability to hear certain sound frequencies and understand speech, consequently inhibiting one’s ability to communicate with others, which is a major problem for many job types. Every year, over 22 million individuals risk losing their hearing as a consequence of subjection to daily noise hazards at work. This translates to approximately $242 million annually in workers’ compensation claims for hearing loss disability. Furthermore, although we can’t eliminate all of the noise hazards at some work sites, we are also not doing everything we can to protect our employees, as is reflected in the $1.5 million in penalties that various companies incurred for not protecting workers from noise last year. 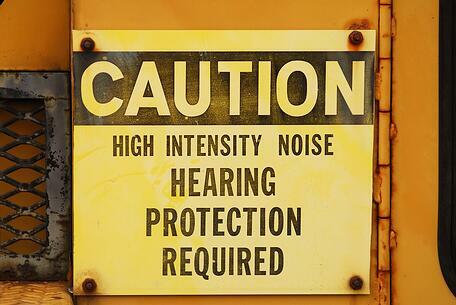 OSHA requires employers to implement a hearing conservation program when noise exposure is at or above 85 decibels averaged over 8 working hours, but clearly this is not always enforced. Recognizing this major problem in the workforce, the Department of Labor (DOL) has continued its aggressive efforts this year to reduce injury and illness rates with the Hear and Now – Noise Safety Challenge. The competition exemplifies OSHA’s push for greater collaboration between governmental agencies and industry professionals on safety projects. Rather than viewing these oversight agencies as enemy watchdogs that only exist to penalize companies for violating safety standards, organizations can benefit from working with them to improve employee safety at both the site and industry levels. Technology that will enhance employer training so that workers consistently wear hearing protection when needed. Real-time detection system that alerts workers when hearing protection is not blocking enough noise to prevent hearing loss. Selective hearing protectors that allow workers to hear important alerts or human voices while remaining protected from harmful noise. Thus, contest submissions can range from physical technologies that improve on current PPE to systems that better enforce the use of hearing protection. The goal here is to introduce cutting-edge methods of reducing hearing loss rates among the American workforce. Anyone interested in participating in the Hear and Now challenge must submit their ideas by September 30, 2016, and the DOL committee will select the 10 best to pitch to an investor/judge panel at the Noise Safety Challenge Event on October 27th. Winning submissions will be discussed with representatives from the National Institute for Occupational Safety and Health (NIOSH) Research to Practice program and the U.S. Patent and Trademark Office. Hearing loss is a common workplace safety issue, but it is certainly preventable. We must continue to seek new ways of preventing work-induced hearing loss, such as using quieter machines, isolating noise sources, minimizing worker exposures, or creating more effective PPE.